The autacoid, adenosine, is present in the normoxic kidney and generated in the cytosol as well as at extracellular sites. The rate of adenosine formation is enhanced when the rate of ATP hydrolysis prevails over the rate of ATP synthesis during increased tubular transport work or during oxygen deficiency. 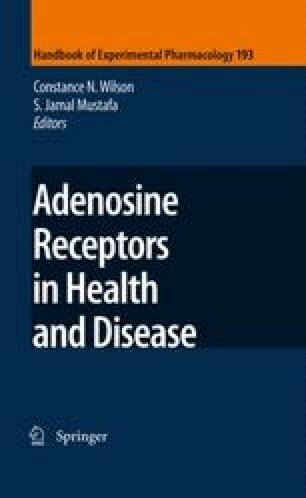 Extracellular adenosine acts on adenosine receptor subtypes (A1, A2A, A2B, and A3) in the cell membranes to affect vascular and tubular functions. Adenosine lowers glomerular filtration rate by constricting afferent arterioles, especially in superficial nephrons, and thus lowers the salt load and transport work of the kidney consistent with the concept of metabolic control of organ function. In contrast, it leads to vasodilation in the deep cortex and the semihypoxic medulla, and exerts differential effects on NaCl transport along the tubular and collecting duct system. These vascular and tubular effects point to a prominent role of adenosine and its receptors in the intrarenal metabolic regulation of kidney function, and, together with its role in inflammatory processes, form the basis for potential therapeutic approaches in radiocontrast media-induced acute renal failure, ischemia reperfusion injury, and in patients with cardiorenal failure. The work from our laboratories was supported by the Deutsche Forschungsgemeinschaft (DFG VA 118/2-1, DFG OS 42/1–42/7), the Department of Veterans Affairs, the National Institutes of Health (DK56248, DK28602, GM66232, P30DK079337), and the American Heart Association (GiA 655232Y).